Three or so in the morning is not, perhaps, an ideal hour to stream full-length feature films online. At least that's how I feel about films I want to watch attentively and in their entirety. So I've developed a habit of using that time frame to try out television shows I hear people talk about. This has proven fruitful, at times, for entertainment purposes. Wasteful, in a sense, for time purposes. But more the former than the latter, as I'm not very capable of watching much of anything online before I've truly given up on other things to do. And I'm almost completely incapable of just going to sleep instead. Well, lately I've been using the rather new series Alphas as the wee hour go-to since I exhausted Downton Abbey and a couple other shows here and there. I'm enjoying it well enough, as it's in the tradition of X-Files, reminds me a bit of Fringe, is set primarily in New York, and is typically at least sufficiently clever and amusing. Oh, and sometimes things blow up. All these things are very good. It also transitions from a more or less feature-length pilot episode to approximately 45-minute chunks. Quite useful for those threes in the mornings. This, of course, didn't seem to make much sense. So I looked it up. It doesn't seem to make much sense to Google, either. And it's not in any blunders or factoids on imdb or Netflix—not that I found at the time, at any rate. I did learn a thing or two, though, about a company called Bushwick Metals that has a plant in New Jersey. If you're looking for punching or drilling equipment, or perhaps carbon steel beams or grating, I know just the 750,000-sf warehouse you might like to visit. So the Jersey indication was probably just a mistake. The show's writers should have Bell (if you watch, you know) fact-check such things from now on. Mistake aside, the nonetheless enjoyable—perhaps even all-the-more enjoyable—episode goes on to feature a somewhat rogue 'alpha' character named Skylar who fabricates extraordinarily engineered contraptions out of an industrial adorned with graffiti. You know, DIY-tech-style. She has a number of tattoos and snazzy highlights. She has a bit of snark and anarchist leanings. She decries 'the system' while selling some of her wares to, well, 'the system.' Her processors and drones and other well-dreamt gizmos are really sweet, after all. We wouldn't want them to get into the wrong hands! Oh, and she meets one of her buyers at a Farmers' Market in Brooklyn Heights. 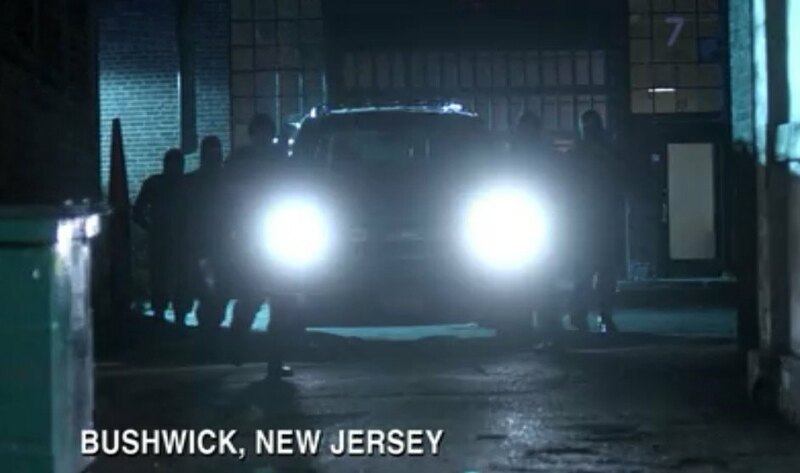 When they wrote that part into the script, might not they have reconsidered their placement of the 'Wick in The Jerz? Anyway, highly entertaining, this episode. Give it a gander. Perhaps your building is in it. Or maybe your graffiti. Or that girl with highlights who used to live down the hall. It's at least one way to kill pre-dawn hours while waiting for the new season of Downton Abbey. On that note, free Mr. Bates!